Certainly most people think of children's stories when they think about storytelling, and for good reason -- in today's world children's stories are the most commonly told. They entertain and teach. They are simple and fun. Daniel Bishop, the Storyteller has numerous traditional and original stories for children. He knows how to grasp the attention of young listeners who are accustomed to flashier entertainment and teach them the uncomplicated joy of story and imagination. These short tales are simple and fun and hold the attention of the little ones. Daniel's playful nature engages the audience and gets them asking, "Will you tell me another story?" From the "Little Red Riding Hood" to "The Life and Times of Humpty Dumpty", let the old favorites become new again in the hands of a professional storyteller. Children have the best imaginations but, like muscles, imaginations get weaker without exercise. Storytelling is the perfect workout for the young imagination. Daniel Bishop, the Storyteller guides the listener through the realm of the fantastic, but each child must visualize the details independently. Kids are growing up faster than ever but, during a compelling story of talking coyotes or wonderous lands, they believe. A story is often the perfect avenue for teaching. Whether your child audience needs to learn the value of honesty or needs a little help remembering how mixing baking soda and vinegar creates a volcano, Daniel Bishop, the Storyteller is sure to have a fun, comical, or unusual story to suit your needs. Concepts learned in context and in an entertaining fashion are sure to be remembered far longer than a run-of-the-mill classroom lecture. Daniel Bishop, the Storyteller has a story for every child, for every occasion. The chidren's stories he tells might be adapted from Aesop, drawn from traditional cultural tales or dreamed up in his own imagination, but they are sure to delight all - whether very young or just young at heart. Did Grandpa tell a good story? Did you have a teacher that spun you a fantastic tale? Do you want your child to hear them? 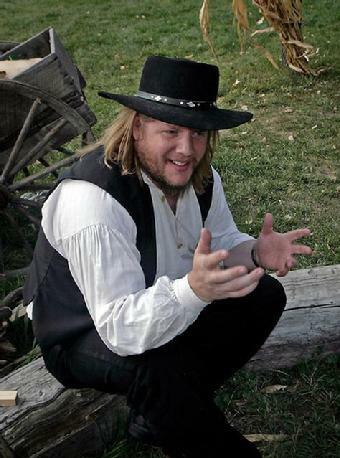 Let Daniel Bishop, the Storyteller know and he can learn those tales for you.